God and Molecular Biology: Red life forms on Mars - Halophiles? Red life forms on Mars - Halophiles? The Great Salt Lake in Utah has an otherworldly quality to it. It is a pink-tinged hyper-saline lake trimmed with a halo of salt that encrusts everything it touches. This inland sea is home to dozens of species of salt-loving micro-organisms - so called halophiles - that thrive in the sodium-chloride-rich soup. 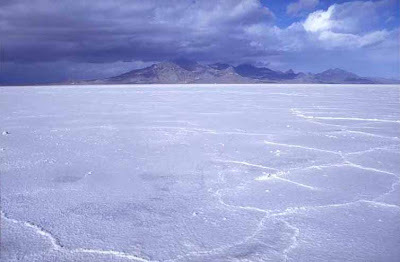 The lake and surrounding Bonneville Salt Flats are the remnants of a much larger, ancient body of water - Lake Bonneville - which drained away thousands of years ago. But despite the lake's historic existence, little is known about its curious inhabitants, and that is something Dr Bonnie Baxter, of Salt Lake City's Westminster College, plans to change. She has teamed up with leading halophile experts, including Dr Shil DasSarma of the University of Maryland, to take the first inventory of the lake's microbes. Dr Baxter has similar aspirations for her Salt Lake inhabitants. They employ solar-powered salt pumps to keep their internal salt concentrations lower than the water around them. But to drive those pumps, the microbes need to be at the surface which means basking in the Sun's damaging ultraviolet light all day. But therein lies their powerful secret. The pink colour of the lake is due, in part, to the pigments - carotenoids - that the lake's microbes produce. These shield their DNA from damage, like an in-built sunscreen, a characteristic Dr Baxter believes could be exploited. In Dr DasSarma, she has a partner of impeccable pedigree for the project. He was the first to sequence the genome of a halophile - Halobacterium species NRC-1 - in 2000. Work on its Utah cousins has only just begun but Dr DasSarma says their initial results are showing just how novel these organisms are. When you compare the DNA of a new species to a gene bank to see if their genes resemble those of known organisms, "normally, three out of four times you find something similar," Dr DasSarma said. "But when you do this with the Salt Lake, the majority of genes are novel - they are like nothing on Earth." It is appropriate then that parallels are being drawn between locations like this and Meridiani Planum on Mars. 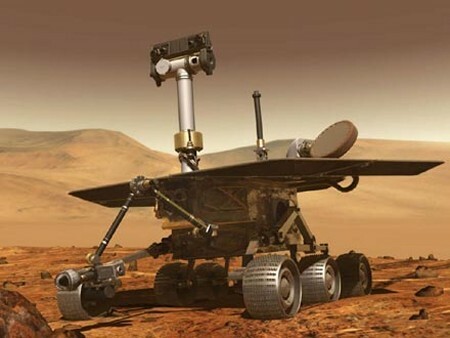 This is where Nasa's Opportunity rover has discovered it is parked on top of an evaporate basin like Utah's Bonneville flats, the remnants of an ancient Martian salty sea. As the conditions on early Mars got colder and harsher, it lost liquid water through evaporation or sequestration into permafrost. Remaining bodies of water would have been increasingly salty places, and then finally all liquid water disappeared, and the salt deposits eventually lithified into the evaporate rocks the rover sees today. Any early Martian microbe would have had to withstand a high salt environment and intense UV radiation. Sound familiar? Shil DasSarma - first life pink?